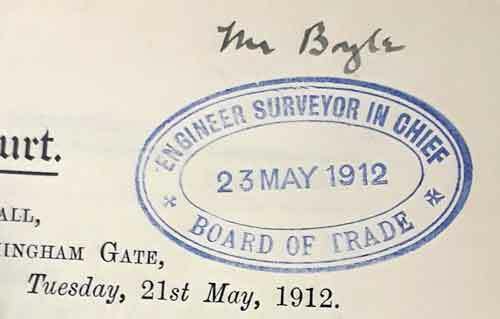 Alexander Boyle was Engineer Surveyor in Chief to the Board of Trade Marine Department. He was aged 61 in 1912. He gave evidence to the British Inquiry, but briefly and late in proceedings (Day 26). A qualified marine engineer, he had nearly 30 years’ service with the Board, with three and a half years as head of marine survey. In answer to Q. 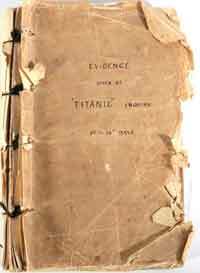 24520, he agreed that his Department was connected with ‘all the machinery and mechanism in the ship’ named Titanic. But there would only be fifteen other questions before Lord Mersey declared: ‘Now that will do.’ Only a few minutes had elapsed, and to 12 of his 16 questions Boyle answered simply in the affirmative, without elaboration — several ‘Yes’ — two ‘That is so’ — two ‘I did’ — one ‘Yes, I did’ — and so on. 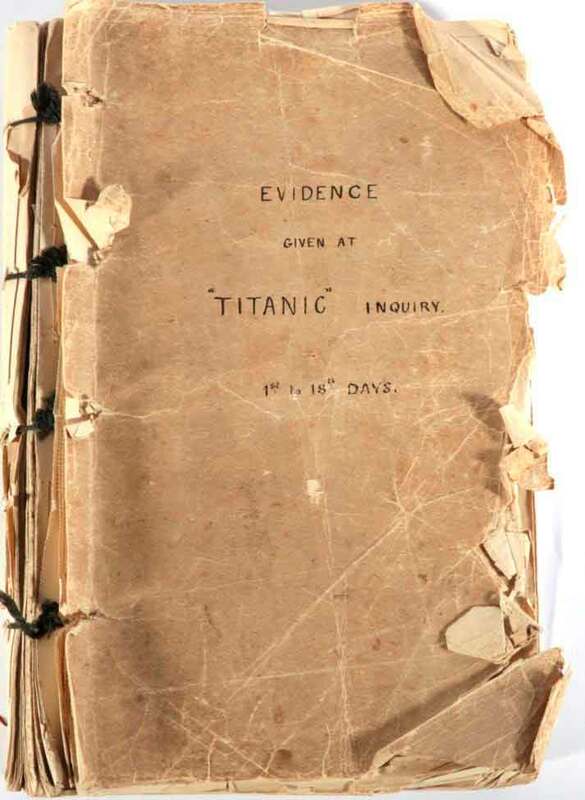 Because of the crucial importance of survey, certification and clearance of the Titanic as fit to sail, it seems possible that Boyle attended earlier hearings of the British Inquiry as an observer. Or perhaps others did on his behalf. We don’t know. 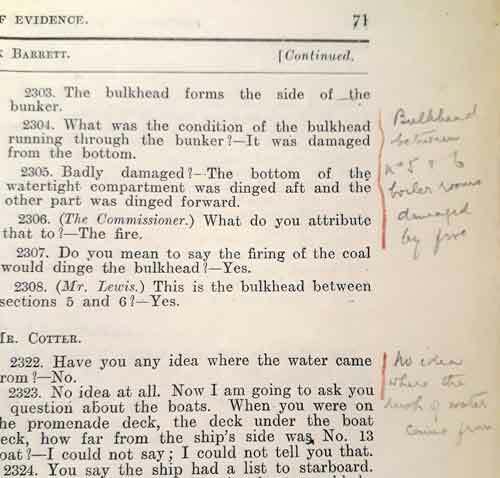 A century later, in December 2018, daily transcripts from the separate British Inquiry proceedings came up for auction (only to be withdrawn when they failed to reach the reserve). ‘The first eleven days also contain various pencil marginalia, hand unknown, together with a pencil cross-section drawing of the ship, with references to the pre-voyage fire and the engineers. Opposite the section of questioning as to whether this could have contributed to what happened subsequently, a large question mark is drawn. 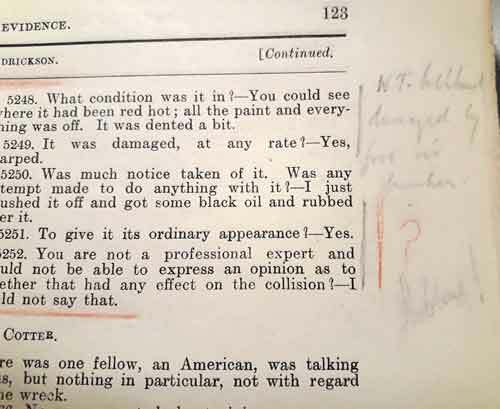 Red marks appear to box off the Hendrickson questions from: Br. 5236 (where he answers that he never saw a coal bunker fire before) to Br. 5252 (His opinion as to whether it had any effect on the ‘collision’ [rather than sinking]). The daily transcripts, relatively costly, were available on an overnight basis, as is the case through court stenographers today. The word ‘Problems!’ thus seems relatively contemporaneous, whoever wrote it within Boyle’s office, and whatever meaning may be ascribed to either the word itself or its exclamation mark, or both. Readers will draw their own conclusions. Charles Hendrickson gave evidence on the British Inquiry’s fifth day, Thursday May 9, 1912. Boyle, by contrast, entered the box on Tuesday June 18. 5236. When did you last see a fire in a coal bunker? Hendrickson — I never saw one before. 5237. It has been suggested that fires in coal bunkers are quite a common occurrence, but you have been five years in the White Star line and have not seen a fire in a coal bunker? — No. 5238. Did you help to get the coal out? — Yes. 5239. Did you hear when the fire commenced? — Yes, I heard it commenced at Belfast. 5240. When did you start getting the coal out? — The first watch we did from Southampton we started to get it out. 5241. How many days would that be after you left Belfast? — I do not know when she left Belfast to the day. 5242. It would be two or three days, I suppose? — I should say so. 5243. Did it take much time to get the fire down? — It took us right up to the Saturday to get it out. 5244. How long did it take to put the fire itself out? — The fire was not out much before all the coal was out. 5245. The fire was not extinguished until you got the whole of the coal out? — No. I finished the bunker out myself, me and three or four men that were there. We worked everything out. — Yes, you could see where the bulkhead had been red hot. 5247. You looked at the side after the coal had been taken out? 5248. What condition was it in? — You could see where it had been red hot; all the paint and everything was off. It was dented a bit. 5249. It was damaged, at any rate? — Yes, warped. 5250. Was much notice taken of it. Was any attempt made to do anything with it? — I just brushed it off and got some black oil and rubbed over it. 5251. To give it its ordinary appearance? — Yes. 5252. You are not a professional expert and would not be able to express an opinion as to whether that had any effect on the collision? - I could not say that. 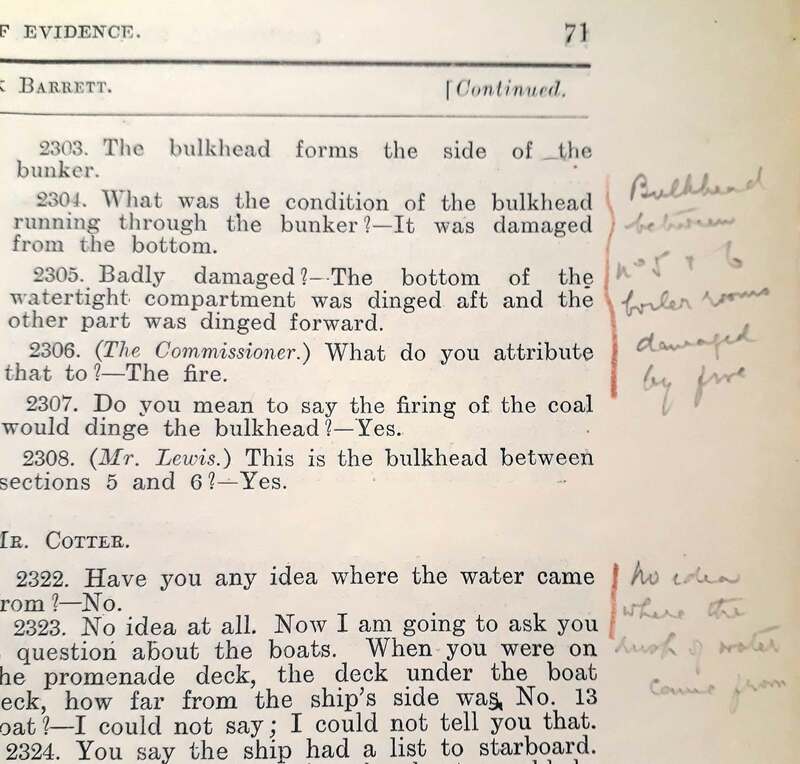 Other marginalia appears against the evidence of leading hand fireman Fred Barrett. Board of Trade Marine Department Engineer Surveyor in Chief Alexander Boyle (of whom no photograph is known) died aged 78 at his home ‘Cartsburn’ (named after the barony of his Greenock birthplace), on February 27, 1929. Join the Coming to the Boyle discussion on our message board, 1 post, last post by Encyclopedia Titanica.